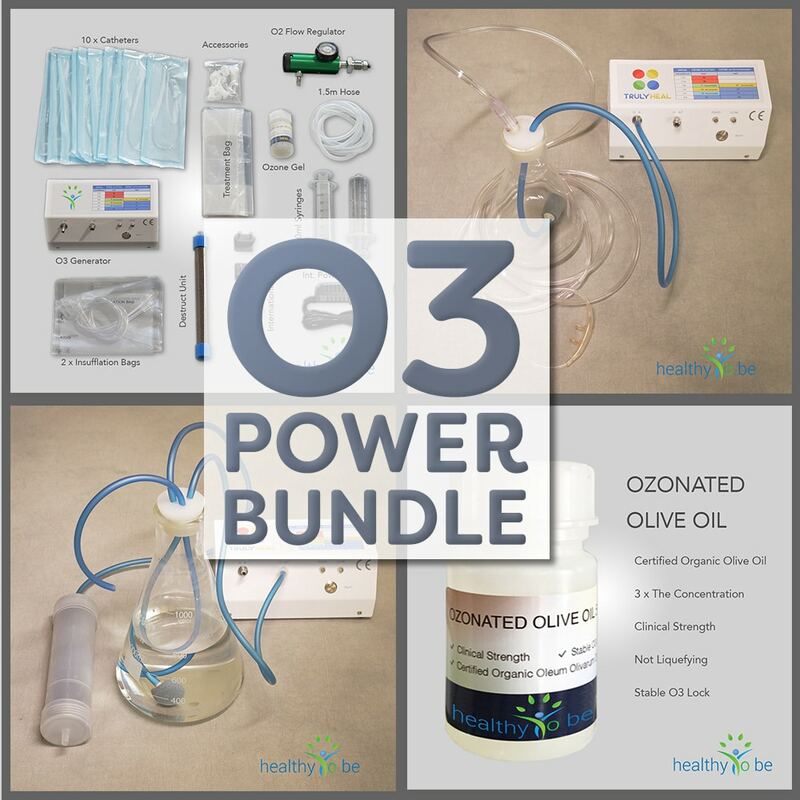 Get your O3 Power Bundle which includes everything you need to set up your Ozone clinic at home. There is actually no difference in the quality of Oxygen between medical (99.8% clean) and industrial (99.5% clean) The big difference is the connector at the bottle and the paperwork associated with medical oxygen. So if you do not have a prescription do not worry and get the industrial oxygen bottle. The main effects of Ozone (O3) is that it kills pathogens like virus, bacteria, mould, yeast and fungi. It is commonly used for industrial air purification. Medically applied O3 also effects solid tumours and floating cancer stem cells in the blood. The tiny amount of Ozone that is used during a treatment will not clean all of the patients blood, it rather kills the pathogens that directly get in contact with O3 and these dead cells then act as a vaccine which stimulates your immune system to attack the pathogen. As soon as Ozone has reacted with any of the pathogens it converts into O2 – Oxygen which is used by the mitochondria of all other cells. Ozone is an oxidative treatment which increases oxygen uptake into the blood. We recommend you look for your local gas supply. Most places that sell you propane gas also offer industrial and medical oxygen. Even Building supply like Bunnings, Mitre10 and so on have industrial Oxygen. In case they ask what you use it for and you want to avoid any lengthy discussion, just say you are breeding fish and need oxygen to transport them in plastic bags. Try to get an annual contract because the bottle will last for a long time. Here at BOC in Australia we get a 20L bottle for AU $90/year with refill. That's a great deal. I assume in the US it's even cheaper. The only difference in using an oxygen concentrator vs a oxygen bottle is the concentration of O3 you can achieve with the generator and the purity of the Ozone. The flow rate of 1/8 l/minute gives you a max O3 concentration of 37mg/l. Top quality concentrators achieve as much as 90% clean Oxygen but the general home use device usually does not get more than 70% to 80%. The Nitric oxides which are an unwanted byproduct of the concentration process can cause unwanted side effects if applied rectal. You can experience blurred vision, confusion, dizziness, sweating, unusual tiredness and potential heart problems. Some doctors that specialize in ozone therapy will recommend not using concentrators as the oxygen source for insufflations or injections for this reason, though many people use them without incident. If you use an oxygen concentrator check that all filters are clean and that the device is placed in an area where is converts fresh air instead of stale room air. If you have already a concentrator at home you may want to try it out before getting a bottle. If you feel no side effects or know that the quality of Oxygen is high then go for it and try it out. Below you see the chart for Ozone concentrations from O2 Concentrators.